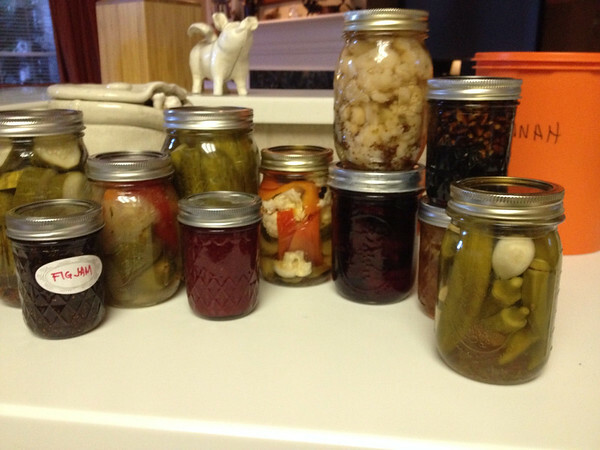 Last month, I decided that I wanted to make a few pickles and some jams. 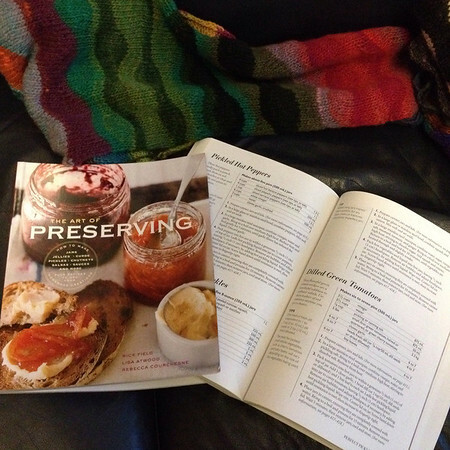 You can find any recipe on Google, but I like having some books as well. I created a monster in myself. The last of the fresh okra was still available in the market, and I thought some fig jam would make nice gifts for my friends. Although I have a pressure cooker, it was a bit small, so courtesy of Amazon I am the proud owner of a 27-quart pressure canner that will handle seven quart jars at once. Of course, I can’t actually lift it when it’s more than half full of water. 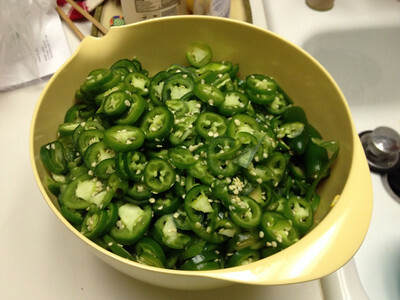 I made a small batch of the okra – four pints – and gave one to a friend. He called later and reported that he had eaten half the jar in one sitting. Okra, seasonings, a clove of garlic, a strip of red-hot chili pepper. Apparently it worked. A visit to the market for Ball jars, salt, vinegar, and other supplies, and I’m ready. What’s this? 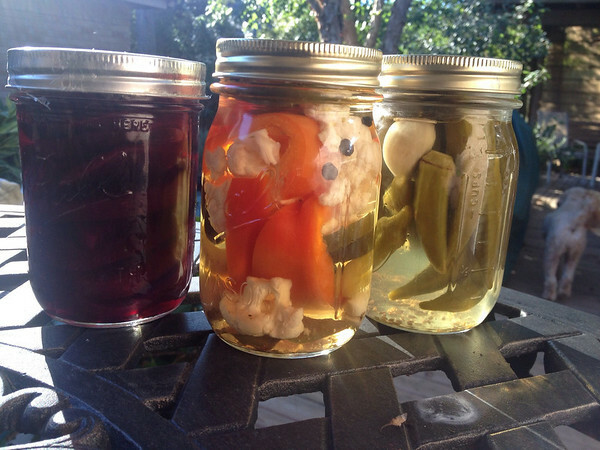 A recipe for cauliflower pickles. What about that great cauliflower/carrot/jalapeno mix available at taquerias? Escabeche! I always called it “those really hot pickled vegetables” but now I know it has a name. Back to the market for more heads of garlic and Serrano chili peppers. Oh, and I should buy enough of the carrots and cauliflower to also make some giardineria, while I’m at it. Beets, giardineria, hot pickled okra with garlic. A friend told me that he ate the entire jar of beets in one sitting, and drank part of the pickling liquid. Wait, you wanted pickled beets? Okay, I managed to find fresh beets at a farmer’s market that weren’t going to end up $20 per jar. 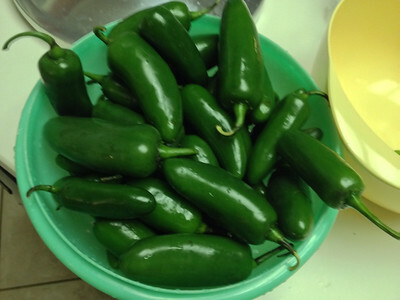 And while I’m here, boy do those jalapenos look good. Four pounds ought to make a couple of jars of these tasty nacho-toppers. And my dad really liked that raspberry syrup I bought for him a few years ago. Drizzled over Dutch chocolate Blue Bell, it’s heaven in the mouth, but I can’t find it any more. But, raspberries are in season and they aren’t the same price as gold this year! And I’ll pick up 15 lbs of apples while I’m here. And the figs. …and done. I ended up with seven pints. And jeez, if I’m making pickles, then I should really make pickles. Cucumbers, check. Also, I have that large can of Steen’s Pure Cane Syrup, and 20 lbs of fresh pecans in the freezer, and this pecan syrup might be good for pancakes. And speaking of pancakes, I bet now would be a good time to make pumpkin butter! Wow! You are an inspiration – it all looks lovely and sounds so tasty! 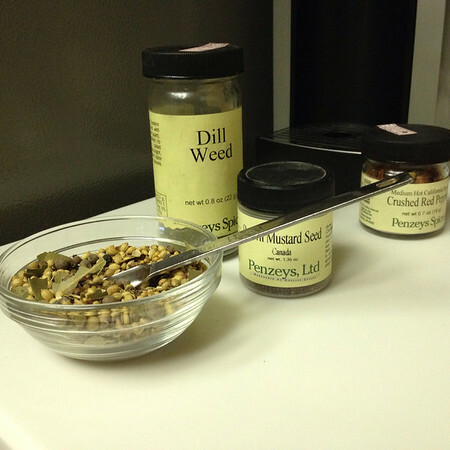 both the jars you sent me…yum. We’re doing the chili soon for some of those peppers to top. plus how pretty does it all look/???? I’ll take the pumpkin butter! Great post! I have giardiniera on my to-do list next week. 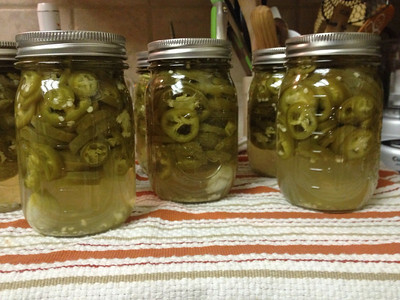 Did you use the pressure cooker to pickle yours? I used boiling water bath on everything shown in my post.